If you’re ever in a bakeshop on Chicago’s South Side, you’ll probably see a towering confection that stacks three cakes into one glorious treat. Welcome to the world of Atomic Cake, where layers of banana melt into fluffy custard, tangy reverberations of strawberry are cut short by deep, rich chocolate, and everything is shrouded in a blanket of whipped cream. To build this gargantuan delight, bakers are tasked with whipping up three different cake bases—banana, yellow, and chocolate—then layering fillings and fruit throughout. After packing in the likes of Bavarian cream custard, fresh bananas, and glazed strawberries, the pastry chef tops each cake with a layer of fudge and a slathering of whipped cream (or, occasionally, buttercream). 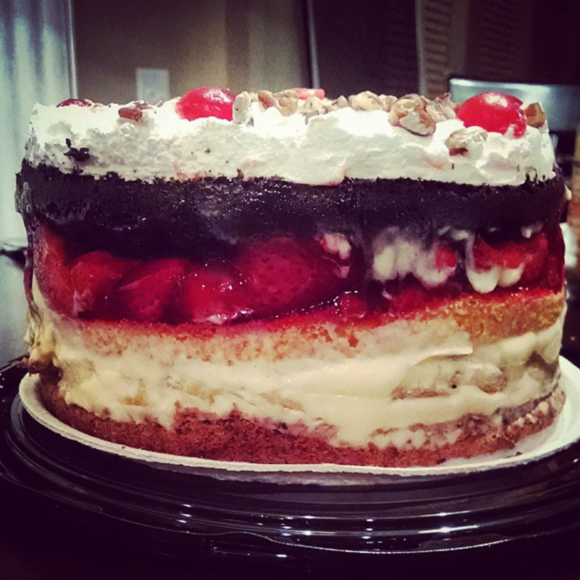 South Side bakeries have been selling the cake since the 1950s. Generations of South-siders think of milestones and rites of passage, particularly birthdays, as cause for the treat. You won’t see kids enjoying a slice after school, because bakeries don’t sell the behemoth creation a la carte. If someone wants an Atomic Cake, they’re buying the whole thing. If you want to try Atomic Cake, venture to the bakeries on Chicago's South Side. Bananas brown when exposed, so bakeries don't sell it by the slice. Oh no, looks like you'll have to buy a whole one. An original (1935) South Side bakery with three locations in Illinois, all of which serve Atomic Cake. The oldest family bakery on the South Side (est. 1930) calls their Atomic Cake the Banana Split Torte. Funerals in the Lone Star State call for this comforting chocolate treat. This Dutch-Indonesian cake contains up to 30 layers. This dessert island is known for its refined layer cakes.